For first time Cruise Captains, there are mentors available. You can partner with an experienced cruiser. Keep your first cruise simple. Relax. Have fun. Don’t stress. That’s what cruising is all about. There is no right or wrong way to organize a cruise. Do what you are comfortable with. This guide gets you started and helps you cover all the bases for planning a cruise. For BBSA members, your point of contact for all cruise planning is the BBSA Cruising Fleet Captain. You can get the guidance you need from the Cruising Fleet Captain, and you can provide the information the Cruising Fleet Captain needs. A Cruise Kick-off Party is scheduled in Jan-Feb by the Cruising Fleet Captain to set up the Cruising Calendar for the year. It helps cruisers plan their summer if cruises are on the calendar early. However, you may add additional cruises to the calendar during the sailing season. Send an email with a completed Easy Cruise Planning Form to the Cruising Fleet Captain from the Cruising Contact page so they can add the cruise to the calendar. 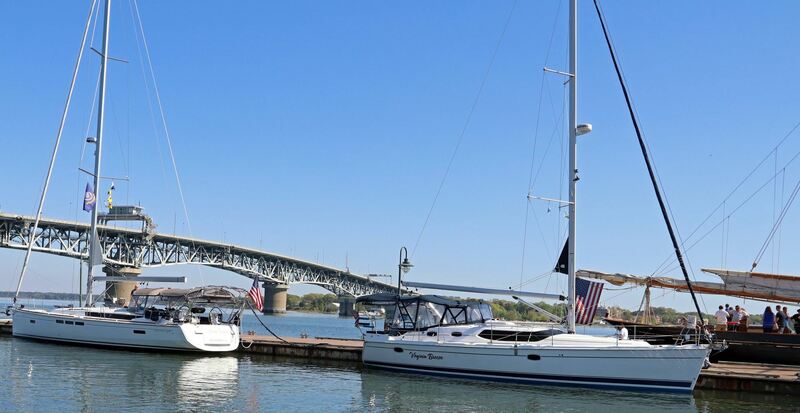 Note that cruises are frequently planned in combination with the Hampton Yacht Club (HYC) Casual Cruisers. If so, the information you provide will be shared between the two groups, so they can be announced in both the Banter and the HYC Mainsheet. The Cruise Kick-off Party held in the winter provides cruisers with an opportunity to socialize and discuss cruises and view the cruising calendar for the year. Cruisers become aware of planned cruises and can host their own cruise by becoming a Cruise Captain. The Cruising Fleet Captain plans the party with the Cruising Captain for the HYC during Jan-Feb. People who sign up as Cruise Captains must be members of BBSA or HYC. The Cruising Fleet Captain ensures the volunteer Cruise Captains understand the expectations for communication and execution of their planned cruise. Decide on a cruise date and destination as soon as you decide to host a cruise. Add this to the cruising calendar at the Cruise Kick-off Party. Make a note of the date. You can provide more details as the cruise approaches. Plan the cruise. You will need to include the details in the Easy Cruise Planning Form. Complete the Easy Cruise Planning Form (available from the Cruising Fleet Captain by email or click on the link below). The Easy Cruise Planning Form will help you organize this information. If you cannot edit or open the Easy Cruise Planning Form, you can always request an email version of the form from the Cruising Fleet Captain. You can enter your cruise information by replying to the email and sending back to the Cruising Fleet Captain. Cruisers need to know the details of your cruise early enough to plan. You will need to have your cruise information ready in time to go into the Banter well before your cruise takes place. If you need help, call or email the Cruising Fleet Captain. Ideally you should complete and send this form to the Cruising Fleet Captain the last week of the month 2 months prior to your cruise. This provides enough time to make reservations and plans for your cruising party. Banter articles are due to the editor before the first of the month. As the cruise approaches, update the Cruising Fleet Captain by email as necessary any alterations to the planned cruise, including more details or any other changes. It is up to the cruise captain to decide if weather will adversely affect a planned cruise. If the cruise is to be canceled or rescheduled, notify the Cruising Fleet Captain as soon as possible. You may decide to go ahead with a land-based event if the cruise is canceled. Once you are on the cruise, conditions may change, and plans must be adapted. Keep your cruisers informed of any changes. If you know of people planning to join your cruise midway, try to let them know as well. If you use a common area at a marina, be sure to clean up afterwards. You may even want to include nearby boats on the dock in your festivities, so they don’t feel like we’ve taken over their marina. We want to be welcomed back. Complete the Completed Cruise Form (download link is above) after the cruise ends. The Completed Cruise Form is a description of how wonderful the cruise was and a recap of the cruise description. Any pictures of the cruise can be provided with the form. Send a copy to the Cruising Fleet Captain so it makes it into the next month’s Banter. As new people enter the BBSA cruising fleet, we realize that we need to explain some of the cruising terminology we use, such as cruise captain, docktails, host boat, and swing room. Boattails: Drinks and food at a specified boat or boats. The Individual Cruise Captain will coordinate times and what people should bring. Cruise Captain: Assumes responsibility for planning a BBSA cruise. See the Individual Cruise Captain Guide for more detailed information. Cruising Fleet Captain: is an elected member of the BBSA board and attends any scheduled board meetingsf. Contact the Cruising Fleet Captain through the contacts page. Develops an overall preliminary cruising strategy for the year in December-January with input from interested members and the board. This includes suggested cruises and ideas for cruises. Manages the cruising calendar schedule for the year. Guides BBSA members on planning cruises. May reserve blocks of slips for “annual” cruises that are known to be in-demand as needed. Organizes a Cruise Kick-off Party prior to the sailing season (see Cruise Kick-off Party below). Provides support and assistance to Individual Cruise Captains as needed. Provides cruise information to the Banter about upcoming and completed cruises. Updates the BBSA website with current information about all upcoming cruises. Cruise Kick-off Party: The Cruise Kick-off Party provides cruisers with an opportunity to socialize and discuss cruises and view the cruising calendar for the year. Cruisers become aware of planned cruises and can host their own cruise by becoming a Cruise Captain. The Cruising Fleet Captain is responsible for planning the party with the Cruising Captain for the HYC during Jan-Feb. People who sign up as Cruise Captains should be members of BBSA or HYC. The Cruising Fleet Captain should make sure the volunteer Cruise Captains understand the expectations for communication about their planned cruise (see the Cruise Captain Guide). Contact the Cruising Fleet Captain. Dinghy Raft Drift: A group of dinghies tied together at an anchorage and allowed to drift with the wind while hors d’oeuvres are passed around and beverages are consumed. Occasionally one of the dinghies may turn on their motor to guide the raft to safe locations. At the end of the raft up, the boats will separate and return to their anchored boats. This is usually when the food or drink runs out. The Cruise Captain should make sure everyone is able to return to their boats or aid as needed. Dinner on Your Own: Usually, we have enough food during docktails that a formal dinner is not necessary, but unless the cruise captain states otherwise, cruisers generally fend for themselves for dinner after docktails. In many cases, people go ashore to restaurants. If the group is large, try to join up with smaller groups for dinner. Tables of more than 6 people are hard to seat, take longer to serve, and make it hard to talk. The cruise captain is rarely responsible for making reservations. Docktails: Drinks and food at a specified location and time on the dock next to the participating cruisers. The Cruise Captain coordinates times and what people should bring. Happy Hour: May be any of the above or even in a common room at a marina. The Individual Cruise Captain coordinates times and what people should bring. Starting times are usually between 5-6. Ending times are usually determined by other plans, like dinner reservations. Hors D’Oeuvres: A fancy French name for food to share with other cruisers at a gathering. Chips/dip, deviled eggs, cheese/crackers are popular items for sharing. Otherwise known as appetizers. Host Boat: The Individual Cruise Captain’s boat(s) or a boat designated to “host” a Happy Hour. If the cruise involves anchoring, the Happy Hour usually takes place on the host boat or boats. If it rains, the boat with the largest, driest cockpit usually becomes the host boat. If the cruise captain feels that their boat is not large enough for hosting, an alternate host boat can be designated even though the cruise captain has planned the cruise. Potluck: This is a more organized dinner that includes side dishes and some sort of main course, either provided by the individual cruisers or by the Cruise Captain(s). Often this involves grilling your own main course with side dishes provided by all. Potluck dinners are also shared at many BBSA monthly membership meetings. Most marinas don’t allow grilling on the dock, so they may provide grills on land for cruiser’s use. Progressive Dinner: A pre-planned organized dinner with meal courses on different boats, either at anchor or at a marina. The Cruise Captain for the progressive dinner will organize who is providing which dishes and where the various participants will go for each course. Rafting: Two or more boats connected in an anchorage on a single anchor. Usually the largest boat sets the anchor, and one or more boats tie up alongside. Sometimes boats choose to remain rafted overnight. Be aware of any strong storms in the area as rafted boats are more likely to drag and need attention during storms. Cruises do not require rafting and are not that common for BBSA cruises except for individual boats. Swing room: Not a place to dance. This is the amount of room boats need to anchor near each other. If you are planning an anchoring cruise, make sure your chosen anchorage has enough swing room for all attending cruisers. Boats with different anchoring mechanisms may swing differently from each other, so account for this when anchoring near other boats.